Maile of Monkeyprints blog fame made it back to Kona from Dalian, China. As we cruised by her old haunts she spied this dress in a shop next to Middle Earth Bookstore where so used to work and quickly went into Chinese haggle-mode trying to get a kamaaina discount. The colorful summer dress fit her well and I have a feeling she will get it eventually, not at full price. She tried to hide as I shot this photo. 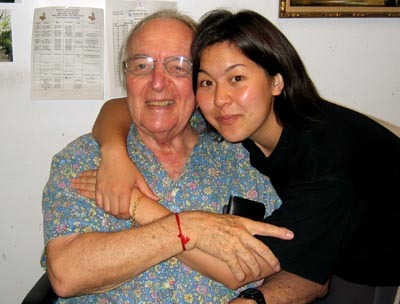 Here Maile gets a reunion with her pop Gean at his working place. I left them catching up on things along with talk of non-profit corporation mergers, transfers of properties and other complicated business talk that makes up her dad’s typical work day. Thank goodness we have someone like Gean to figure all of this stuff out.